You will enjoy Minesweeper Land game if you like playing Minesweeper game too. Windows Phone 8 game Minesweeper Land has the same logic with classic Microsoft Minesweeper game with different layouts. 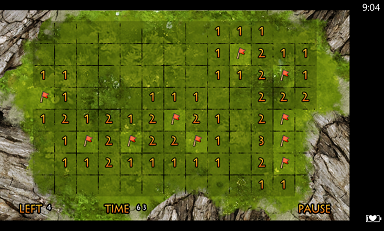 This free Minesweeper game provides 4 different lands for game players to discover and clean all mines on these lands. You feel like you're playing on a real map to discover and conquer! Tap on a square on the map to open it. If you keep tapping on the map for a while, a flag will appear for minesweeper players to mark the mine. In order to win the game, you should open all clean areas and mark all mines with flags. If you also want to play this game on your Windows Phone 8 smartphone (also for Windows Phone 7.5), launch Windows Store app and search for the game with name "Minesweeper Land". The free Minesweeper download size is around 14 MB. You can also visit the Windows Phone game app Minesweeper Land official store page at Windows Phone.